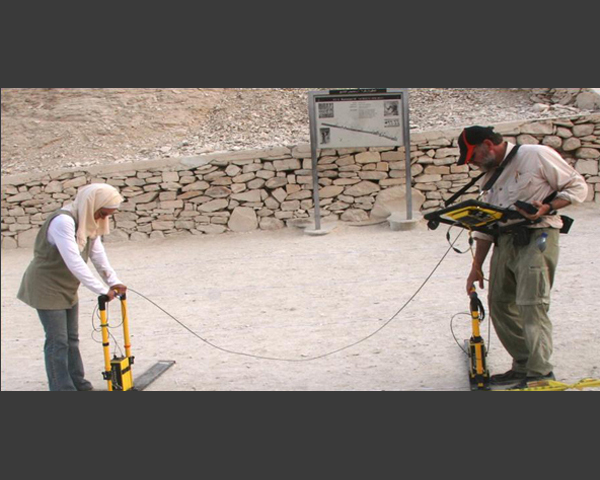 Glen Dash and Joan Dash perform a ground penetrating radar scan in the Valley of the Kings between the tombs of Amenmeses and Rameses III. In performing this scan, the Dash Foundation used a Sensors and Software radar with 50MHz antennas. The work was performed for the Supreme Council of Antiquities, Dr. Z. Hawass, Secretary General. Photograph by Afifi Rohim Afifi, who was Dr. Hawass' field director for the project.